As you're driving down the highway on your next road trip, take a look at the signs advertising what food options are available at the next exit. Almost all of the food options are fast food. Obviously, fast food is convenient and predictable, but what if you want to eat something different? 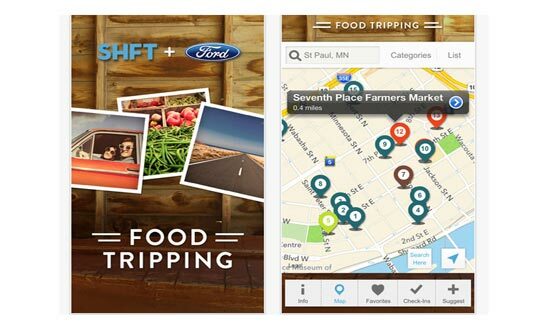 SHFT, a multi-media platform company, recently released a smart phone app called Food Tripping to help consumers locate local foods (watch the video below for a brief summary). Food Tripping uses GPS to locate local restaurants, juice bars, farmers’ markets, microbreweries, etc. Users can search by location, name, popularity, and category (see Image 1). Each listing gives the address, phone number, category, website, directions, and "sharing" capabilities (via email, Facebook, and Twitter). You can also view a list of past businesses you've visited when you "check-in" or "add to favorites". Think of it as Foursquare just for food. As an ag business owner, how will this new app help you? This sounds like another great way to bring new customers to your business without any cost to you. The app is free (available on iPhone and Android devices) and anyone can make a free listing for a business. All you need to do is click the "suggest" button and fill out a very short form with your business's info. Once approved, your business will be listed in your area. Why not take 5 minutes out of your day to create a listing and get some free advertising? As a consumer, would you use an app like this to visit a food business in a town you're unfamiliar with? As an ag business owner, have you listed your business on other apps (like Foursquare)? Has your listing attracted new customers?